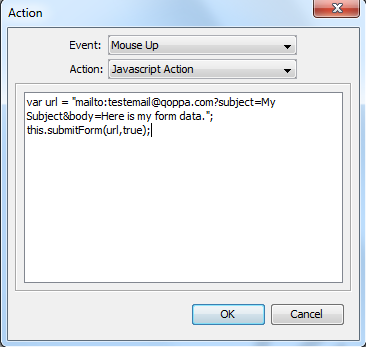 Q: How can I send email that includes the form data file using the submitForm action? 5. Change email address, subject and body to contain the information you wish to see. When you click on the button, PDF Studio will ask permission and then open the mail application with the subject, body specified above and the form data as an attachment. Make sure your email application has been configured correctly. You can refer to our knowledge base entry to change default email application.